SamuiBus.com | Book Airport transfer to Maenam in just a few minutes! Maenam it occupies a large territory: its length is more than 2,5 miles. Curves of the coastline are mostly framed by low bushy palms, making the beach here and there looks like real tropical garden. In its generous shade it is unspeakable pleasure to lie in a hammock near to your bungalow. 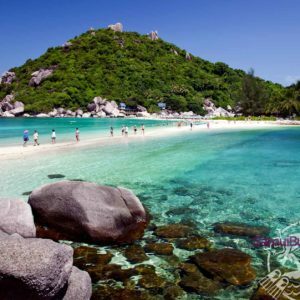 This is one of the most popular and populated beaches on Koh Samui and undoubtedly it is one of the most picturesque beaches. Get from the Koh Samui Airport to the hotel in MaenamBeach and back will be so easy if you will think about it in advance. Just book Transfer service!